BIXBY, Okla. (Nov. 1, 2018) – The Institute for Excellence in Writing (IEW) is hosting their annual online Winter Retreat on December 8, 2018, intent on providing educators with refreshing and informative content. “The conference was really useful for me. Even the sessions that I wasn’t interested in somehow hooked me in, and I stayed to listen to them. I am so grateful to have found IEW,” said Jane Cooper, an attendee of one of IEW’s virtual retreats. 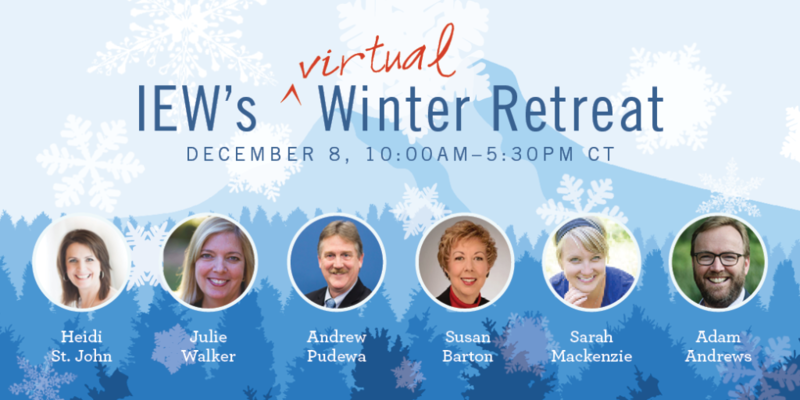 Speakers at IEW’s Winter Retreat include founder and director Andrew Pudewa, Susan Barton of Barton Reading & Spelling System, Sarah Mackenzie from Read-Aloud Revival, Adam Andrews from CenterForLit, author and speaker Heidi St. John, and IEW’s marketing director, Julie Walker. IEW’s Winter Retreat is free and open to anyone wanting to learn more about dyslexia, reading, and writing and what IEW does to motivate and assist teachers, parents, and students. IEW’s mission is to equip teachers and teaching parents with methods and materials which will aid them in training their students to become confident and competent communicators and thinkers.